Reacts specifically with 10kDa protein of rat CP12 cell extract. 15 residue N-terminal synthetic peptide (Rat). Our Abpromise guarantee covers the use of ab2102 in the following tested applications. SNARE involved in vesicular transport from the late endosomes to the trans-Golgi network. Membrane. Cell junction > synapse > synaptosome. Western blot - Anti-Cellubrevin antibody (ab2102)Image is courtesy of an anonymous AbReview. Blot was blocked with 5% milk for 1 hour at 25°C. Publishing research using ab2102? Please let us know so that we can cite the reference in this datasheet. I received 125 uL instead of 200 uL. The order number is 87602 lot number 66469. Ab5789 is listed as a VAMP3 antibody, and ab2102 and ab2103 are listed as Cellubrevin antibodies. Are they the same? Are the peptide sequences available for ab2102 and ab2103? Have any of these antibodies been tested for cross-reactivity with guinea pig? Regarding ab2102 and ab2103, unfortunately the peptide sequences are not available. If you have any additional questions, please let us know. Thank you for your enquiry. Cellubrevin is an alternative name for VAMP3, and so these 3 antibodies target the same protein. Ab2103 has been tested for cross-reactivity with Human and Mouse, and does not cross-react with Rat or Dog. Ab2102 cross-reacts with Rat and does not cross-react with Human or Dog. Ab5789 cross-reacts with Dog, Human, Mouse and Rat. So none have been tested yet for cross-reactivity with guinea pig, to our knowledge. I will try to obtain the peptide sequences for ab2102 and ab2103 and will let you know. 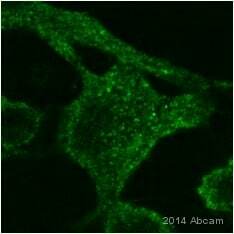 This antibody works in immunofluorescence, the suggested working dilution is 1/50. It reacts with rat cellubrevin; rat PC12 cell extract is positive in Western blotting. It should certainly work for IF with CHO cells transfected with rat cellubrevin. (For reactivity with human cellubrevin, use ab2103). Will this antibody recognize mouse cellubrevin when used in a western blot? The antibody has not been tested for cross-reactivity with mouse. However, the antibody was raised against a synthetic peptide from the rat N-terminal region, and is thought likely to recognise mouse.